We will be flying into Geneva, and making a short transfer to Annecy. After bike prep and an early night our trip begins the following day. Our high point will be the Col du Grand Cucheron at 1203 metres. From here we will descend into the town of La Chambre. The following day we will climb the infamous Mount Vernier before climbing the Col de la Croix de Fer at 2067 metres. From here we descend back to the town of La Chambre. 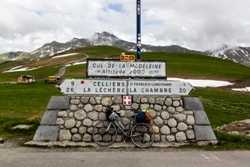 Our final day will see us make one final big climb up the Col de la Madeleine 1996 metres. The descent will take us back past through Albertville finishing off at Annecy. Here we will have a final night together before airport transfers the following morning. On day 1, Adventure cafe will arrange an airport transfer for you and your bikes to Annecy. Here we will prep bikes before having an evening meal and an event briefing. On the second day we will ride out past Lake Annecy before taking on our first climb of the trip. As we enter the afternoon we will tackle our first Col, the Col du Grand Cucheron before taking our descent into the L'Arc Valley and our over night destination. On our third day we will follow the L'Arc Valley to the infamous and stunning climb of Montvernier. From here we will drop back into the valley, before climbing out of the town of Villargondran towards the col de Croix de fer. we pass through a few small towns before taking on the Col de la Croix de Fer topping out at 2067 metres. From here we will cruise back to our over night accommodation in La Chambre. Our fourth and final day of riding will see us heading out La Chambre and back towards Annecy, with the small matter of the Col de Madeleine. Once we have accomplished this final Col we have a final long descent before a (relatively) flat ride back to Annecy through Albertville and alongside the lake before our final overnight stop in Annecy. Here we will have chance to celebrate this mamouth cycle ride. On the fifth day we will transfer back to Geneva airport and our final farwells. Day 5: Morning Transfer to Geneva Airport. We will be staying in 2/3* accommodation in twin and triple rooms. This trip is designed to be a moderately priced challenge - although room upgrades may be available for a small fee. None required for this trip (if you are an EU citizen. If from further afield you will need to check requirements.) You should hold an EHIC card and comprehensive travel insurance. 4 nights accomodation - 4 Breakfasts - Support vehicle - first aid mechanic driver - Cycle Leader - Event Planning - Airport Transfer. We will run this challenge during summer - and have mild warm and sunny weather. Be prepared for hot and sunny conditions - so be prepared to protect against the sun. Equally however, we could get unlucky! So pack rain jackets and warmer clothes too! Just in case….